Didn't see a Man-At-Arms review thread yet. If I'm wrong, mods, please merge this. I have just finished uploading pictures of Man-At-Arms! Lots of good shots of the 200x Power Sword as well! The video review will definitely be up on the front page this week! Got lots of work to do!! He-Ro photos will also be uploaded. I'll post them int he He-Ro review thread! For toy review videos and more, visit Pixel-Dan.com! Feel free to send it to me! I'll take extras that no one wants! Wow, what's with the terrible paint job on the blue arm band? I hope they all aren't like that. Last edited by The.Idea.of.Evil; June 17, 2009 at 12:59am. What is the Idea of Evil?? I miss the grumpy old man wide head of the original figure And his boots were more brown than charcoal grey... Oh well, whatcha gonna do . nice pics, I'll probably replace the 2002 power sword with this one. Hey Pixel Dan, does the 2002 mace fit in this new Man-at-Arms? I love this figure! I can't decide which head I like most (and I'm biased towards the mustache head usually). I love the sword. I'm sure lots of other ppl here will agree with me that anyone that doesn't want the 200x sword can pass it on to some of the other people here. I agree that it looks stupid with he-man because the colours mismatch though I'm going to be giving mine to Faker though so it's no worry. Faker's gonna pwn He-man and teach M@A a lesson in why voice recognition as the only security measure was a bad idea! thanks for the photos Dan. Cool for eternian soldier army builder figures though! I'd say MAA is my favorite out of everyone. I'm very impressed! Never been a fan of Man-At-Arms, and that 200X sword is super lame. This will be a really boring purchase for me. As much as I don't care for Man-At-Arms though, he is 100 times cooler than that He-Ro thing. I can't believe people actually like that figure. I definitely won't be purchasing him. Last edited by TCM Hitchhiker; June 17, 2009 at 05:32pm. Thanks for sharing...... can´t wait for the video-review ! Moustache or not ? I can´t decide yet.....Aaaaarrgghh !!! Awesome! Thanks for the pics! Sad to see that his mace looks like it's made out of rubbery plastic...one big thing I liked about these is that the accessories are hard plastic, so I can pose them without the weapons drooping like the 200X figures. Oh well, at least it's thick. Otherwise, it all looks great! I love how shinny the 200X sword is! Shinny shinny shinny. Too bad it doesn't twist anymore, though. I loved that feature. Hope it still fits snug in 200v He-Man's hand, though, I may stick with the gold trimmed one for him anyway (since it still opens). Can't wait for this guy! Alexx has a blog?! Come on in and check out Toys and Tomfoolery! You won't regret it...until the next morning. Yeah the paint app is looking average. But at least he's got all the right appendages (still bitter over 4/4 screwed up Faker's). So we're getting a couple of the Castle grayskull weapons with MAA. I wonder who will be packaged with the others and if they make a rack available? I'm favouring the clean shaven head, but they both look great. According to the new bio's there's no reason King Grayskull would have the 200x sword, but I was curious to see him with it. Thanks for the great pics Dan. You lucky #$%^! I don't get my figures till 20 odd days after they go on sale and I almost feel like there's no point opening them since I've seen your video's months in advance. awesome pixel dan! thanks for sharing and, btw, I'm not a fan of the 200x power sword too, but heck.. is a bonus weapon right? looking forward to see your video review! Good pictures. I just don't like the new extra techno sword, but my figure will stay in box, so I don't care too much about it. VERY important question for you PixelDan! Is his arm armor one or two pieces, and if it's two can it fit (at least somewhat) on his right arm as well? I'm wondering because if it CAN, then if you buy two of him you could use the extra armor to make a Filmation version of him! Please let us know--and thank you! The Cradle Will Rock As I'm Drivin' Down Highway 40 In My Big Ol' Pick Up Truck. Hanging for MAA, my fav to date, and someone else is looking forward to him too, he needs his sword!! VERY important question for you PixelDan! Is his arm armor one or two pieces, and if it's two can it fit (at least somewhat) on his right arm as well? M@A looks great I'll be buying two just like I did with Mer-man.I like the clean shaven face alot more since the other head doesnt look like M@A at all. The 2002 sword looks like it has chicken pox,I wish somebody would have stopped the horsemen from making all those rivets or whatever they are.Good thing they don't own a bedazzled machine. Other then the chicken poxs and the sword being way too shiny, it actually doesnt look too bad.Still wish we would have gotten an arm cannon. Nice work Dan. I'm jealous. It seems like I just finished taking photos of Hordak and you are already working on MAA and He-ro. I can't wait for your video review. Looks like MAA will be the first one that I buy more than three of. I think I will get 5 to have a couple of royal guards. My MAA will be with the mustache and the guards mustacheless and without arm and leg armor. As for the 200x sword, I kinda look forward to it. It looks more fun than the regular power sword. The handle is definitely longer so it is easier to hold it with two hands. 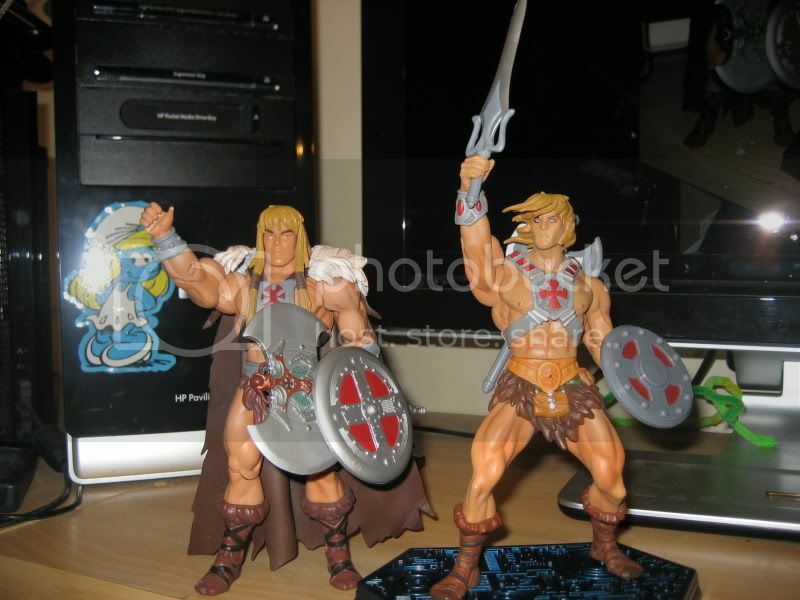 I'm gonna have to add more to my He-man gallery for sure. I think am more excited about MAA than Hordak and he is not even a character I like much. Thanks Dan for the great pics!!! I love that all the armor is removable. I love that MAA comes with so much accesories and weapons (he is really a Man at Arms!!). I love both heads (Ill add a Eternian Royal Palace Guard to my collection). But I don´t like the sculpted belly in a dressed figure, so please 4H, due this line is a fully success, sculpt a lower torso abd part with no belly for dressed figures!!! PLEASE!!! PD: Why the boots aren´t orange/brown? Thanks for the great pics! Looking forward to next month already! Lol, Ok you can have mine too, I was gonna throw it out too! Last edited by Staff Of Ka; June 17, 2009 at 06:35am. Drowning in a Sea of Plastic. All times are GMT -4. The time now is 05:22am.